Marketing a destination is slightly different to marketing a tangible product. This is because you are trying to drive people to your location, rather than getting them to make one-off purchase decisions. If you put yourself in your typical customer’s shoes, not only do they have to make an initial purchase, but they then have to spend a day (perhaps longer) travelling to your location, they need to have spending money for the day itself, then they have to travel back home again afterwards – it’s a big decision. Not only does your consumer have to commit to going to your destination, but it takes plenty of planning as well (especially if they are travelling with children). For these reasons, destination-based purchase decisions tend to be more considered than those for tangible products. Your consumer has to know that visiting your destination will be worth the time, money, and effort that they are going to invest. This is where content marketing comes in. To make people visit your destination, you have to create a buzz around your brand, generate a sense of excitement, and inform your audience that your attraction is worth it. This all comes down to how you communicate with them, because if you don’t sell yourself properly, they aren’t likely to make an impulse decision to visit your location. 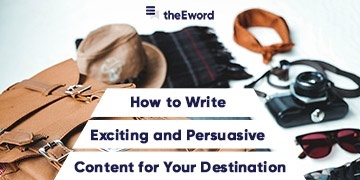 So, we’ve decided to highlight a few ways to make your destination stand out through your written content. If your the target customer is discovering your destination for the first time, they aren’t going to know what to expect. It’s your job to educate them about what you do, because they are unlikely to make blind purchases when it comes to visiting your destination. All of your content should educate the reader, but you should consider whether they are interacting with your brand for the first time or they have demonstrated an interest in visiting before, because this will change how you communicate with them. If your destination is a theme park with a thrill-seeking target market, you should use your online content to inform them about how great your rides are for adrenaline junkies. If you’re targeting families who have only just come into contact with your brand, you should create content that educates them about how your destination will give them a satisfying family bonding experience. How you deliver this content depends on where your audience sits in the buyer’s journey, because your language will change depending on how well they already know your brand. If you’re communicating with people who have visited your destination before, you can use more salesy language to educate them about what you do (think along the lines of emphasising any new must-visit features), but if they are just finding out about your attraction for the first time, you should ease them in with the core offering of your destination. Brands have been using emotions to sell their products since the early days of marketing. In fact, almost every product is tied to some sort of emotion. When it comes to promoting your destination, you’re at an advantage, because your product is based around an experience, which generates its own real-life emotions. You can then tie these emotions in with your content strategy, because they act as promises that you can actually fulfil when your consumers visit. If you know that your audience wants to feel something in particular, you can create content that inspires this in your reader. If your destination provokes a sense of awe in its visitors, you can create content that focuses on this feeling and helps your audience to associate your attraction to this emotion. For example, if you offer a tour that takes visitors deep-sea diving, you can tie the feeling of adrenaline in with the activity that makes up your content strategy. When you’re writing content that promotes your destination, it’s important that you use language that drives your reader towards making a purchase decision. This doesn’t necessarily mean being overly salesy, especially when you’re communicating with awareness-stage users. But it does mean that you should avoid using negative language that tells your readers what they shouldn’t be doing, rather than what they should be. When it comes to marketing a destination, speaking to your reader as if they are already at your destination can prompt them into a positive mentality about visiting your location. Writing in this way builds a sense of excitement and helps them to visualise themselves enjoying the experience. This is where emotions are most effective, because you can tie them into your writing and build a vivid image of the destination. Don’t hesitate to get in touch, so you can ride our big rollercoasters. This is because the former uses positive language that urges the reader towards an action, and it ties in the emotion associated with riding on a rollercoaster, creating a vivid and exciting image in the reader’s mind. If you’re looking to put together a strategy that increases footfall to your destination, take a look at our Destination Marketing Guide, or see how our team of experienced marketers can put your destination on the map.